Ruby's name comes from the Latin root word "Ruber" meaning red, from which also is taken the name rubellite for red tourmaline. It is the red form of the gem corundum and is second in hardness only to diamond. Occasionally rubies occur with minute inclusions arranged in a pattern which reflects a floating six rayed star when viewed under a single light source. These are known, appropriately enough, as Star Rubies. Rubies are found in Thailand, Burma, Kampuchea, Kenya, and several other countries, often in alluvial deposits where they washed down rivers as gravel and collected in pockets of gem gravels. Burmese Rubies have always been thought to be the finest and most celebrated. The king of Burma was called "The Lord of the Rubies." 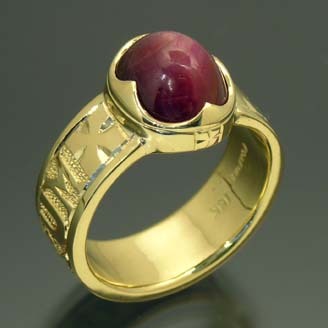 The stone was sometimes known as Oriental Ruby, to differentiate it from lesser stones. The Burmese believed that Ruby ripened in the ground, starting as yellow and changing and deepening until it achieved the vibrant crimson color. There are many properties tied to this renowned gemstone. Because of Ruby's blood red color, its magical significance is often tied to curing diseases of the blood and stopping bleeding. Tales are told of warriors who had rubies implanted under the skin to bring valor in battle. It was rumored to light darkened rooms with its glow and boil liquids when placed within them. Ruby was supposed to ensure harmonious physical and mental health, bring peace, and guard homes and fields against storm and catastrophe. The fiery red gemstone was said to attract and maintain love, and ward off sorrow, inspire boldness and bring success in business. It was supposed to keep away plague, and relieve pain. Ruby would warn its owner against disaster by turning black when danger was near. As an interesting parallel to physical reality, Ruby will turn black when heated with a torch, returning to red as it cools.